Based on reviews from 94 experts and 1,019 users. 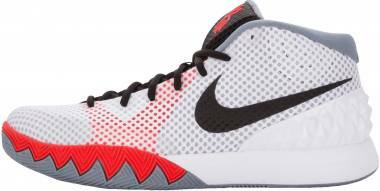 Learn how our rankings work or see our guide to Kyrie Irving basketball shoes. Updated Apr 2019. Kyrie Andrew Irving is the Rookie of the Year in 2012, a multi-time All-Star, and an NBA Champion. 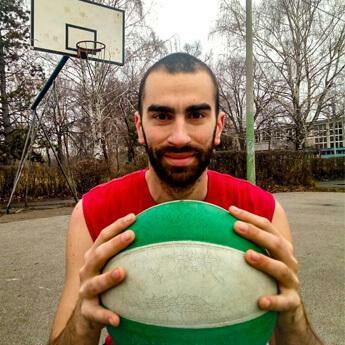 He has been compared to several NBA greats such as Allen Iverson and Kobe Bryant. Many of his peers consider him as the best one-on-one player in the NBA. It is next to impossible to stay in front of him because of the burst in his first step. Others have tried giving him some space so that they won't get beat to the basket, but when they employed this tactic, Kyrie would just casually bury a jumper in their faces. There are countless videos on the Internet of Irving putting his defender to shame. His play even caught the eye of Pepsi, and the company eventually asked Irving to be one of their brand's promoters. Thus, many of his fans refer to him as "Uncle Drew", which is actually the name of Irving's basketball-dominating geriatric alter ego that Pepsi came up with. Many knew Irving was a special player even before he joined the NBA. During his lone college season at Duke University, he averaged 17.4 points per game on a tidy 53.2% shooting efficiency. His then coach Mike Krzyzewski paid him the ultimate compliment when he told Irving, "You'll be one of the best of your generation." Unfortunately, his college basketball career was plagued with injury. He suffered a severe ligament injury in his right big toe during the 9th game of the college season. The said injury kept him on the sidelines indefinitely and ultimately out of the running for NCAA Freshman of the Year. Irving returned just before the first round of the NCAA Tournament. The Duke Blue Devils would eventually bow out of the tournament when they fell to Arizona. Irving scored 28 points in the loss. However, his past injury did not discourage the NBA scouts. He was highly sought after, and the Cleveland Cavaliers were lucky enough to have the first pick in the 2011 NBA Draft. After going first in the draft, he proved early on that he belonged in the big league. He dazzled fans and players alike with his creativity, handle, and scoring ability. It was apparent even at this stage in his career that he was going to be one of the greats to play the game. Irving would go on to win the 2012 Rookie of the Year Award. Many knew that this was just the beginning. Over the next two years, he would establish himself as a player to watch and a player who could erupt at any given time. In just his second NBA season, he already participated in the All-Star game. The year after that, he was named the All-Star Most Valuable Player. In the 2014-2015 NBA season, Irving, in the 4th season of his young career, helped propel the Lebron-James-led Cavaliers to the NBA Finals, where they lost to the Golden State Warriors. However, they would get revenge the following year when they beat the Warriors 4 games to 3. The victory was capped off by Irving's otherworldly shot over the outstretched arms of GSW starter Stephen Curry in the last minute of the game, which the basketball world dubbed “The Shot”. Kyrie has gained a lot of fans because of his clutch gene. He seems to relish the closing moments of a tight ball game because they give him a chance to win the game for his team. It almost feels like he has ice in his veins during these moments. This, combined with his amazing handle, shot-making ability, and overall skillfulness, truly makes him a special player. Irving currently plays for the Boston Celtics. Many sources have deciphered that he wanted out of Lebron's shadow in Cleveland. Some of his previous coaches and teammates have said that Kyrie is such a skilled player that him not leading his own team would be a waste. As someone once said, "The true test of greatness is time." Time will tell if he can replicate his success with the Cavs in Boston. But judging by his past accomplishments, once Kyrie sets his mind on a challenge, he destroys the competition and wins the game. In 2011, Kyrie Irving signed an endorsement deal with Nike. Three years later, in December 2014, he joined the likes of Kobe Bryant, LeBron James and Kevin Durant as he was given a signature shoe deal, making him only the 20th athlete to be offered such a deal. The basketball star is reported to earn $8 million annually from Nike. The Kyrie Irving shoes are considered by Forbes to be the second best-selling signature shoes, next only to LeBron shoes. The Kyrie 1 debuted as Irving’s inaugural sneaker on December 23, 2014. Leo Chang, Kevin Durant’s main designer for his KD basketball shoes, brought together a team of footwear designers to brainstorm and come up with a blueprint for a shoe that is befitting of the All-Star player. It was said in an interview that their performance priority for the Irving shoes was to provide a dynamic grip that complements the athlete’s moves on the court. The first pair of Kyrie Irving shoes utilizes an aggressive herringbone pattern that rides up to the walls of the midsole. This facilitates the stop-and-go power that is needed even when Irving’s foot goes into very steep angles. Irving usually plays on his toes. Taking note of this, Chang embedded a rectangular Zoom Air unit in the forefoot. Hyperfuse is used on the upper. This consists of fabric mesh glued to a fuse material. High-wear areas are coated with another protective layer for rigidity and durability. The collar is thickly padded and when laced to the top, helps clasp the ankle for a secure fit. Irving says that he does not want a basketball shoe that’s too high, so the designers go for a mid-top that just covers the ankles. As for aesthetics, the peaks on the shoe’s midsole is inspired by the Sydney Opera House while the spikes on the shoe’s heel was meant to be similar to the ones on a Christian Louboutin heel which alludes to the athlete’s love for high-fashion accessories. Lastly, the midsole’s design takes after vulcanized skater shoes since Kyrie, at a younger age, loved to skate. 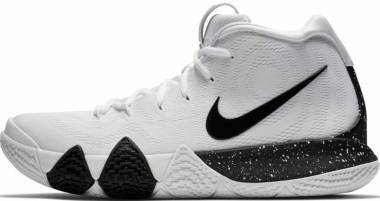 The Kyrie 1 was what Irving was wearing when the Cleveland Cavaliers played against the San Antonio Spurs on March 12, 2015. Scoring a career-high of 57 points, it was Kyrie who brought the Cavaliers into overtime by scoring a three-point shot milliseconds before the timer ended. Although not available in retail, the colorway is available on NikeID as the Nike Kyrie 1 “57 Points”. For Kyrie Irving’s second signature shoe, Leo Chang prioritized not only traction but also speed and stability. 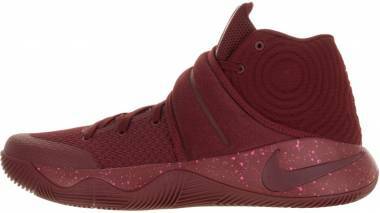 Taking inspiration from motorcycle wheels, the Kyrie 2 is acclaimed as one of the top performing tractions of 2015. The outsole takes it to another level; it experiments with multidirectional lines and concentric circles on the forefoot for fast-paced movements. Both the outsole and midsole take from the vehicle's rounded wheel. The shape is based on the concept of banking, where it was scientifically proven that moving from an angle increases speed and stability. This is exemplified by motorcycle drag racers when they lean on their motors at a very steep angle to maximize their turning efficiency. The midsole contains a Zoom Air unit on the heel for impact protection—a first for Kyrie basketball shoes. An Ortholite insole is also included within the shoe for immediate stepping comfort. The midsole’s walls extend a little bit, just enough to cradle the foot, providing containment and lateral support - avoiding rollovers. The Kyrie 2 “Finals” EP was what Irving was wearing when the Cleveland Cavaliers reached the 2016 NBA Finals and played against the Golden State Warriors for the second time. Upon reaching game 5, with 3 wins for the Warriors and just 1 for the Cavaliers, Irving and James dominated the game and scored 41 points each–a first in the NBA–bringing about game 6. Game 7 was a close fight until Irving shot a three-pointer with 53 seconds left on the clock closing off the 89-89 tie. The Cavaliers brought victory to Cleveland on June 19, 2016 after 52 years of NBA championship drought. After Irving was shown pictures of him doing crossovers, the NBA athlete was surprised. The third Kyrie Irving shoes were designed to support him in these kinds of ankle-breaking situations. Lockdown and fit are the highlights of this shoe. The third Kyrie iteration also improves on the already stellar traction of the Kyrie basketball shoes line. The Nike Kyrie 3 uses an aggressive herringbone pattern on the outsole that rides up to the midsole, to cover the player’s lateral movements. Two multidirectional pods on the forefoot help with side-to-side movements. The midsole’s shape retains the rounded geometry to assist Irving’s risky low angles. Although minimal in cushioning, a Zoom unit is embedded in the heel to protect the player during landing. The upper is made of mesh that is padded with foam. It also has fuse and rubber overlays. After a few wears, the upper molds to the foot’s shape. A Flywire-reinforced foam band is integrated into the forefoot for maximum flexibility. As usual, Irving adds personal touches to his shoe such as JBY and H+H on the tongue, signifying his mottos in life. The roman numerals VIII and XIII that are tattooed on Irving’s wrists can also be found on the shoe’s insoles; they stand for his late mother’s birthday. Lastly, his daughter’s name Azurie and mother’s name Elizabeth are embossed on the outsole, in the heel area. It just gets better and better. After establishing its niche on traction with the first Kyrie Irving basketball shoes, further perfecting the outsole while adding a rounded-out midsole with the 2, and slowly focusing on fit and lockdown with the 3; Irving and his team balance everything out with the Kyrie 4. Designed by Nike senior footwear designer Benjamin Nethongkome, everything about the Kyrie 4 is an upgrade from its predecessors. 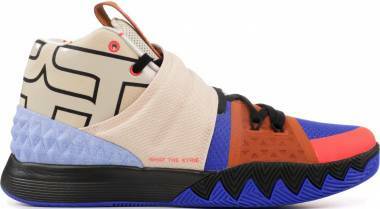 The fourth Kyrie Irving basketball shoes are serious with traction. If you are wondering how the love child of an aggressive herringbone and a zigzag pattern would look like, look no further. The shoe’s outsole features a pattern that is multidirectional in nature and grips onto any court surfaces, and that’s after just a brief break-in period. The shoe’s midsole peaks into the forefoot. When the laces are tightened, the peaks and forefoot Flywire grasp the foot, leaving no dead spaces. The midfoot down to the heel is covered by a TPU heel cup that also cradles the foot from behind. What the three previous models lacked in the cushioning department is very much remedied by the fourth. It now has a full-length Cushlon that has a Zoom unit embedded in the heel, making it the most comfortable Kyrie Irving shoes to date. The past two Kyrie basketballs sneakers focused on the concept of banking. Nethongkome takes that idea to another level by decoupling the bottom of the shoe, as evidenced by the zigzag flex groove on the outsole. A mixture of suede and mesh is used on the upper, inspired by Irving’s love for old-school 90s basketball shoes from Jordan and Nike. Retailing at only $120, premium materials and tech have never been so affordable. The first Kyrie 4 colorway is dubbed the ”Confetti.”. It is said that during the 2017 NBA Finals, when the Golden State Warriors defeated the Cleveland Cavaliers, Irving could not forgot how a confetti was stuck to the bottom of his shoe while the Warriors were celebrating their win. To this day, he uses this as a reminder and motivation to push himself forward to his goals of excellence and to winning his next championship ring. From the Kyrie 1 to the Kyrie 5, the performance evolution of Irving’s signature line has been incredible. These Nike basketball shoes boast an updated Zoom Air unit, a new containment system, and an improved traction pattern. Dubbed Air Zoom Turbo, the new-and-improved articulated Zoom Air bag provides enhanced responsiveness in every direction. The Zoom Turbo unit curves and wraps the entire bottom of the forefoot; allowing the All-Star guard to do his thing on the hardwood. The Nike Kyrie 5’s new containment system takes inspiration from a carnivorous plant called the Venus Flytrap. Aside from adding aesthetic appeal, the arrangement of the Flywire improves the overall fit and feel of the shoe. The containment system is also designed to lock the foot firmly on top of the Zoom Turbo unit to amplify responsiveness at the forefoot. 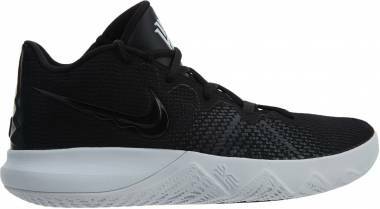 These Kyrie Irving basketball shoes are also equipped with a new traction pattern that provides increased stability on the court. Inspired by Irving’s Hamsa tattoo, the outsole features discreet geometries that enhance grip and stability on the hardwood. Aside from his main signature series, Kyrie Irving has a secondary shoe line that offers no-nonsense performance at a budget-friendly price. Nike Kyrie Flytrap. The first Kyrie Flytrap from Nike features a knit textile upper for increased support and durability. 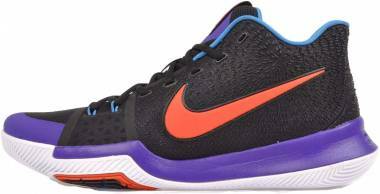 These basketball shoes are also equipped with an Injected Phylon midsole and forefoot Zoom for responsive cushioning. Nike Kyrie Flytrap 2. These cheap Nike basketball shoes boast a curved outsole for all angle traction. Nike’s Kyrie Flytrap 2 also features a forefoot Zoom Air unit for increased energy return and an elastic forefoot band for enhanced containment. The All-Star NBA player is very hands-on when it comes to his Kyrie basketball shoes. He is very vocal with what he wants in his shoe, and he works very closely with his designers. Here are some of the great minds that have assisted the NBA All Star in creating his now sought-after Kyrie Irving shoes. Popularly known as Kevin Durant’s main signature shoe designer, Leo Chang states that he got into footwear design due to his obsession with sneakers since grade school. “I loved Nikes; it wasn’t just shoes, it was Nikes because of the innovation and the crazy designs," he says. Realizing his predisposition to the arts, Chang enrolled as an Industrial Design major in Rhode Island School of Design after seeing a student’s shoe design under the program. On 2000, during his sophomore year, he applied and was accepted as a trainee to Nike’s internship program in the Running department. Chang recalls the experience as an incredible time since it was also nearing the Summer Olympics and he got to sit next to some of the designers who worked on Olympic sprinter Michael Johnson’s gold spikes. After Chang’s internship stint, he worked for several other companies before returning to Nike as a full-time designer. On 2007, he was reassigned to the Basketball department, which he was very happy to accept. One of his first main projects was to lead the design team to create a signature shoe for the newly drafted number-two pick Kevin Durant. Other than the KD line, Leo Chang also designed the Hyperdunk 2016 and the first three Kyrie shoes. Chang described Irving as someone who is very open and great in articulating what he wants. Both the designer and the NBA star worked hand-in-hand to complete the Kyrie 1, 2 and 3. Later on, Chang handed the Kyrie 4 to another Nike senior footwear designer Benjamin Nethongkome. Born in Thailand, Nethongkome and his family migrated to the United States and settled in Miami, Florida when he was 10. As a child, he was always interested in the arts and sports. He studied at the Design and Architecture Senior High (DASH) in Miami. By college, it was a no-brainer for him to pursue a career in the creative industry. He took up industrial design at the College for Creative Studies Detroit. Similar to Leo Chang, he also applied for Nike's internship in 2007 and landed as a footwear design intern under the Jordan Brand. Before designing for Kyrie's signature line, Nethongkome expressed his desire to work with Chang but was told to build up his experience first. At that point, the rookie designer took on jobs at the Court Performance and Innovation Kitchen of Nike. Through those experiences, he was able to design the LeBron Witness 1 and Kobe Mentality 1, of course for two other Nike signature athletes LeBron James and Kobe Bryant. He finally got to work with the legendary Chang in the Kyrie 4 team, of which he is the senior lead designer. During interviews, Nethongkome mentioned how they worked very closely with the athlete to get the fourth Kyrie Irving basketball shoes right. Little is known about the emerging footwear designer aside from the fact that Nethongkome also loves music and DJs every so often. A North Carolina native and an alum of the North Carolina State University, Jason Petrie has been LeBron James' lead designer for the LeBron basketball shoes ever since the 7th shoe when he took over Ken Link who last worked on the LeBron VI. He is also a part of the team that designs the LeBron Soldier series. Petrie shares how, growing up, he used to sit at his mother's dining room table and draw sketches of shoes that he loved. Before working for Nike, Petrie interned at Converse in the late 90's and later on worked as a footwear designer at Fila. When he transferred to Nike, he was able to be a part of the team designing Amar'e Stoudemire's shoes. Six years into working for Nike, Petrie was told by Ken Link, his senior designer, that he will be taking over as the main designer for the LeBron VII due to Link's move to the Cleats department. This brought about a shift for the best in LeBron's sneaker line. Petrie was invited by Leo Chang to join the design team for Irving's first signature shoe, which was also well received by basketball players and considered a solid shoe to play in. Peter Fogg is a retired footwear designer who had been in the shoe industry for more than 20 years. He started drawing at a young age. His mother was an art teacher and his father, a shop teacher. He was quite clueless on what degree to take in college. One of his professors suggested that he check out the Industrial Design program in San Jose State University. Upon finishing the degree, he had hoped to become a car designer, but had difficulty in getting a job. Fogg worked in several other companies before even considering the shoe industry. Right before entering Nike, he was working at Boeing in Seattle where he designed aircraft interiors. Unfortunately, Fogg resigned from this job after being diagnosed with cancer, which led to several months of successful treatment. After the ordeal, he reached out to his former classmate Dave Schenone who was, Nike's design director at that time. Fogg was hired and was assigned to Running. During this time, Fogg created some of the most iconic running shoes such as the Terra Humara, Minot, Terra Sertig and the Terra Albis. After six years he was moved to ACG (All Conditions Gear) where he designed boots and watersports shoes. Later in his career, he was brought into the Basketball department where he designed the Hyperdunk 2013 and other projects such as the Kyrie 1. Kyrie Irving is known to add personal touches to his Kyrie basketball sneakers. Some of which, like his mother’s and daughter’s name, are a staple throughout his signature shoes. The NBA star puts his family first and honors them through the added details on the Kyrie basketball shoes. Jagged teeth. The jagged teeth that form the peaks on the Kyrie 1’s midsole walls represent the iconic Sydney Opera House. Before Kyrie Irving was born, his family relocated to Melbourne due to his father’s basketball career. Irving holds a dual citizenship since he was also born there. Elizabeth. For Irving, family always comes first. And it has been a constant in most of his models to feature the name of his late mother, Elizabeth. The family lost her to sepsis when the NBA player was just 4 years old. He continually honors her by adding details about her, into his signature line. Azurie. Along with his mother’s name, Irving makes it a point to insert his daughter’s name Azurie in the designs of all Kyrie Irving shoes. VIII XIII. Eight-thirteen for Irving means August 13, signifying his mother’s birthdate. The Roman Numerals are tattooed on his wrists and also printed on the insoles of his Kyrie 3’s. 8 13 67 and 9 8 98. The numbers represent his late mother’s birthdate and date of death. The numbers are seen on the inner part of the Kyrie 2’s midfoot strap and the Kyrie 1’s outsole. For the fourth Kyrie shoe, an All Seeing Eye is embossed on the shoe’s tongue pull-tab. Popularly thought to be an Illuminati sign, sports journalist Nick De Paula explains that it is not. Instead, it is a symbol to "challenge everyone to seek their own answers beyond the ones that are given to us by books, media, internet, etc." Kyrie Irving is known to debut his new model in December every year; little is known as to why. However, the release dates of his Kyrie basketball sneakers have been consistent ever since the Kyrie 1s. Additional colorways are then released afterwards. In order to buy cheaper Kyrie basketball shoes, it is a rule of thumb to avoid buying basketball shoes during its release dates. These are usually when the shoes are at its highest price. After a few months, the price usually starts to go down. 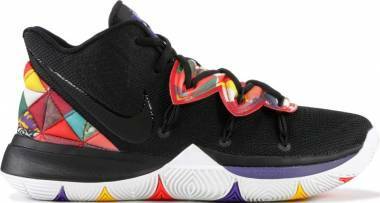 As for Kyrie Irving shoes, their prices are most likely at their lowest during the month of November when shoe stores usually sell off what remains of the previous models to make space for the newer one, which is usually released in December. Other than basketball, what are some of Kyrie Irving’s interests? Irving comes from a family that is both athletic and musically inclined. His mother was a classically trained pianist and could read music and play by ear. Irving takes after his mother and plays multiple instruments. Other than music and sports, Irving launched his own luxury underwear collection called PSD Underwear in 2015.